My guitar pedal board floats between large and massive. The layout depends on the musical projects I’m in; when I was in the country band, it was much smaller. Currently, I’m working on a hard rock/metal project, which is why there are three distortion pedals. The only time I make an actual effort to downsize is when I need to actually leave the house with it. Two or three rehearsals at something other than my house and I’ll start shedding pedals like a Appalachian Trail through-hiker sheds ounces. I’ve been clinging to a quixotic dream of replacing the pedalboard with an iPad and a small Bluetooth pedalboard. With the recent of release of the BlueBoard and the iLoud, I was able to start trying to make my dream a reality. Here’s how the BlueBoard and iLoud combo fared in this quest. IK Multimedia’s BlueBoard ($99) is a small 4-button Bluetooth pedalboard that works with your Mac or iOS Device. It is powered by 4 AAA batteries (included). The unit seems sturdy enough, but the buttons are made of a soft gel-type material. The ex-roadie in me wishes they were made with traditional stomp pedal switches due to their proven durability. The battery access panel and the power switch are on the bottom device and it won’t take any external power sources, so it’s a little tough to attach permanently to a pedal board. A big concern I have is the unit getting stolen during a gig, but it’s small enough to be stowed away during set breaks. One surprising discovery was that the BlueBoard has some fairy hefty system requirements. Not so much in the RAM/CPU department, but it requires a device that supports Bluetooth 4 LE (Low Energy). This means the iPhone 4S and later, the iPad 3 or later, and the iPod Touch 5th generation. Now, the iOS device requirements aren’t that surprising. What surprised me is that I can’t use the BlueBoard on my mid-2011 MacBook Pro as Bluetooth 4 LE is only available on the mid-2012 or later models. While IK Multimedia does say some Bluetooth dongles do work with the BlueBoard, they didn’t have a list of supported dongles in time for this review. The BlueBoard requires a separate app (the iRig BlueBoard app) that runs in the background and hands off the MIDI button presses to IK Multimedia’s AmpliTube (or any of their amp apps) via CoreMIDI. Getting the BluebBoard attached to my iPad and working with IK Mutimedia’s Amplitube was a challenge I needed to enlist their tech support in resolving. I registered the BlueBoard’s serial number in the BlueBoard app and the app would register the key presses. Unfortunately, I could not get it to hand off the key presses to Amplitube. It turns out I also needed to register the BlueBoard within Amplitube to get it working. The MIDI stuff is either an in-app purchase (apparently, even on the paid version of AmpliTube), but if you have one of IK Multimedia’s MIDI products, it is free. Once I registered the pedalboard within AmpliTube, it worked fine. There are two modes to the BlueBoard: Program Change and Control Change. Program Change lets you switch between presets in Amplitube, and Control Change lets you turn stomp boxes on and off. You can only have one mode active at a time, so you can’t switch between presets and turn on a stomp box without changing the mode. In Program Change mode, you can switch between the banks by pressing the A and B keys on the BlueBoard. You can change between Program and Control Change modes in the BlueBoard app. You can have over a hundred presets stored in AmpliTube. If you are in Control Change mode to use the BlueBoard to turn on stomp boxes in AmpliTube, you’ll need to press and hold the On switch for the stomp box in the AmpliTube preset to tell it what MIDI control will activate the stomp. When you have that prompt, simply press the button on the BlueBoard you want to assign. Note: if you have more than one preset you want to assign footswitch controls to, you will need to do it for all of the presets; telling button A to turn on the first effect in my High Gain preset will not turn on the first effect if I’m in my Clean preset. I found the BlueBoard to be responsive with no discernable lag between button presses and the app performing the command. If you need a multibutton Bluetooth pedalboard, and your app supports CoreMIDI (unfortunately, apps such as AmpKit do not support CoreMIDI), I heartily recommend the BlueBoard. Originally, I tried to use AmpliTube and and the BlueBoard with my stage amp and met with disappointing results; I just couldn’t get a good sound through AmpiTube, a y-cable, and my tube amp (it just sounded too thin, especially on heavy metal sounds). I was ready to declare that part of the experiment a failure until the iLoud showed up on my doorstep. 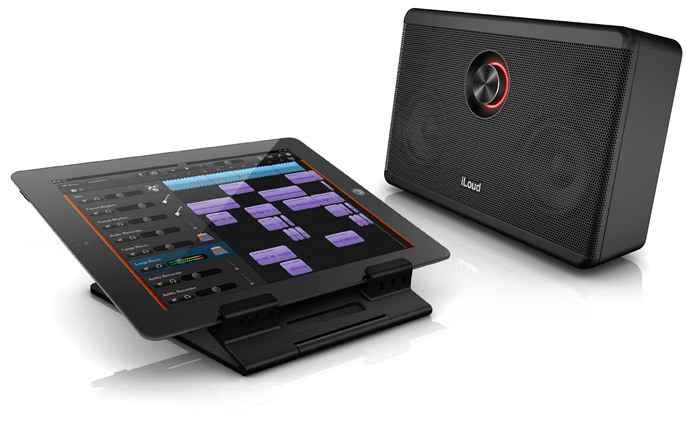 The iLoud ($299) is a small Bluetooth-enabled 40w powered speaker system (it also runs on a battery that IK Multimedia claims will last up to 10 hours). I had thought that since it was Bluetooth, I could go totally wireless (and had dreams of mounting an iPhone on my guitar strap as a completely wireless solution), but due to latency concerns, IK Multimedia does not allow AmpliTube to send sound via Bluetooth. Pity. The unit also has a built-in iRig instrument interface and sends audio to and from your iOS device with the included TRRS cable. For my testing, I used my physical iRig connector, because I felt the 30-pin connection sounded better. Using this setup, I have started to realize my dream of going wireless. Using the Soldano amp ($6 in-app purchase in AmpliTube) and the iLoud I got a decent classic rock/heavy metal sound. I did have to play with the controls a bit to eliminate some hiss (which is pretty much the norm with any high-gain rig), but even when the unit was cranked I got a nice consistent sound. You can also, obviously, connect the iLoud to your Mac and use it as an external speaker. I was really happy with the iLoud as well. The on-board iRig is nice, and since it doesn’t use the main connector on your iOS device you can charge your device while playing through it. It gets plenty loud enough, but I doubt it will get over a full band at a practice. One of the slow epiphanies I’m reaching is that I don’t need one device to do all things. Smaller, separate devices that do things adequately are fine, too. Using the iLoud and the BlueBoard in some situations is a good example. I doubt this setup will ever replace my live rig, for the main reason I need some decent amp overhead and I have an expectation that audio fidelity will hold up at high sound levels. However, the amount of times I need all that juice is rare. Where I expect to use this setup is jams and rehearsals I don’t need to lug the big rig. If I get together with some friends after work to jam, I just need to toss my iPad, the BlueBoard, and iLoud into my gig bag and I’d be good to go. Depending on the band, I also think this setup may work out. I was in a loose jam band a while back that met for fun. The rehearsal space was up three flights of stairs with no elevator. I would tend to need either just a slightly distorted sound, or one I layered some effects on. I’m pretty sure the BlueBoard + AmpliTube combo would have worked fine plugged into the PA in the rehearsal space. Also, I’ll set up some sounds that sound good for songwriting and use the BlueBoard to switch between effects practicing or recording demo tapes. The BlueBoard definitely brings me one step closer to going all-digital. All I’m missing are some amp models I’m very happy with; I really wish IK Multimedia offered the same excellent amps on from their OS X Custom Shop on iOS. Hope you can help since the BlueBoard’s user manual doesn’t really offer any help. Got the BlueBoard a few days ago and have yet to be able to use it. I can’t get it to pair with my iPad or iPhone. Neither device will “discover” it. I’ve tried everything I can think of: turning all devices on and off, doing a reset of the iPad and iPhone, removing and reinserting batteries, uninstalling and reinstalling the app – nothing! Not only is the scan button in the BlueBoard app not available, a message pops up that says “Bluetooth Unsupported” “The Device Doesn’t Support Bluetooth LE.” I just read that the board needs to be registered within AmpliTube. I’m not sure how to go about doing that. Any advice before I send this thing back? I really want it to work. Yes, it’s the casual environment where I’d like to have small portable gear that could still fill an otherwise quiet room. After trying iPad-based solutions like this I’ve realized that it’s primarily for casual players or serious musicians in a casual environment. Nothing other than the Axe Fx has come close to replacing big pedalboards and 100W heads. It is possible to connect to older Macs if you also own one of the supported iPads by using the iPad as a bridge for Core Midi on an ad hoc network. Of course this is not great but at least it’s possible. As a keyboard player I was excited to get one of these units to give me some more live control but IK have sabotaged it so badly with poor design choices that it’s likely I will never buy another one of their products. You can’t even copy one preset to another in the control software. You can’t use it with anything that doesn’t support low power Bluetooth. You can’t use the USB connector for power to save batteries because it faces down and all your connectors will poke out the bottom of the box. This potentially useful product ended up causing me so much aggro I almost tossed it into the trash. It was only after I came up with idea of using the iPad as bridge that I was finally able to get it to work with Mainstage. It just about fits the bill now, but I’m far from impressed wit IK. Thank you for your input, we are always looking to evolve our apps so I will forward the information to the right people. The USB connector is not meant as a main power or connection and is for firmware updates which is why it is designed that way. Still, I see your points and will forward your requests. For those that fall within the specs for iRig BlueBoard, we find they are reporting a very smooth and quality experience, using it both live and in the home or studio with great results. Again, thank you for your input. Dropbox completely. The service is free to use, and has a native app for Windows, Mac, iOS, Android and Linux. It does everything dropbox does, but it’s faster, more efficient, and you start out with more space which is permanent.